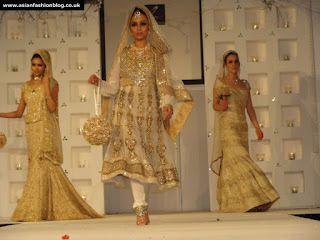 Asian Fashion Blog: Asiana Bridal Show 2009 in Birmingham. Khushboo collection. 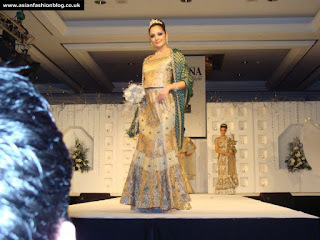 Asiana Bridal Show 2009 in Birmingham. Khushboo collection. I finally managed to get hold of some catwalk photos from the Asiana Bridal Show 2009 which took place in Birmingham at the Hilton Metropole on the 1st Feb this year. A big thanks to Shiraz Saeed for letting me use his photos. Here are some of the outfits from the Khushboo collection. The show included these white and gold churidar suits, accessorised with flower pomanders. I think these outfits look very beautiful, and the long sleeves are good for those ladies that don't want to show off their arms. More gold outfits followed, again accessorised with flowers. I like the shape of the skirt on the first outfit above, and the way the netting underneath is exposed as part of the design. I like the incorporation of green with the gold in the second outfit, if you click on the image to look closer, the skirt and the top don't even have any green on them and it's only the duppata which is green. 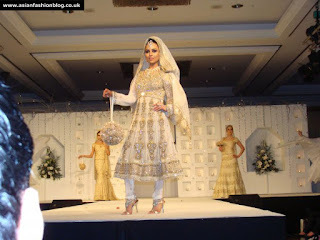 That's all from the Khushboo collection, look out for my next few posts which will have more photos from the runway show at the Birmingham Asiana Bridal Show 2009.
i was loving the long anarkali frocks but hate the shorter ones, so not loving this gold and cream creation. the skirt outfit showing the netting at the bottom...what is with that - did they run out of material = tacky from knees downwards!! absolutely stunning!!! beautiful choice of colours...khushboos hav always beeen the best!! Khushboos is simply the BEST! People are coming out with mixed views of the shop and the service that is provided. Chand is the best when it comes to made to measure. My sister got her wedding outfit from there, and it was amazing! Chand designed it himself and did a wonderful job! He has alot of unique pieces in the shop, he is pricey but your money is not going to waste. For me and my family Khusboos is SIMPLY THE BEST! Hi, could somebody please tell me the average price ranges for bridal outfits designed by Chand? I am getting married in 7 months and i love some of these outfits but, with birmingham being really far, i only want to go if its worth it?